3 miles today on the schedule. Done. It was much cooler today and had a nice breeze too. 1) The Solstice Run - Northville, MI - I originally told you guys I was going to do the 10k but I ended up signing for the 10 mile. The hilly 10 mile. My plan - just do my normal long run for this race. No race. I repeat....no racing. At least that's I will try to tell myself the day of the race. This was my first longer distance race last year. My Dad and I last year at Solstice Run before it started. 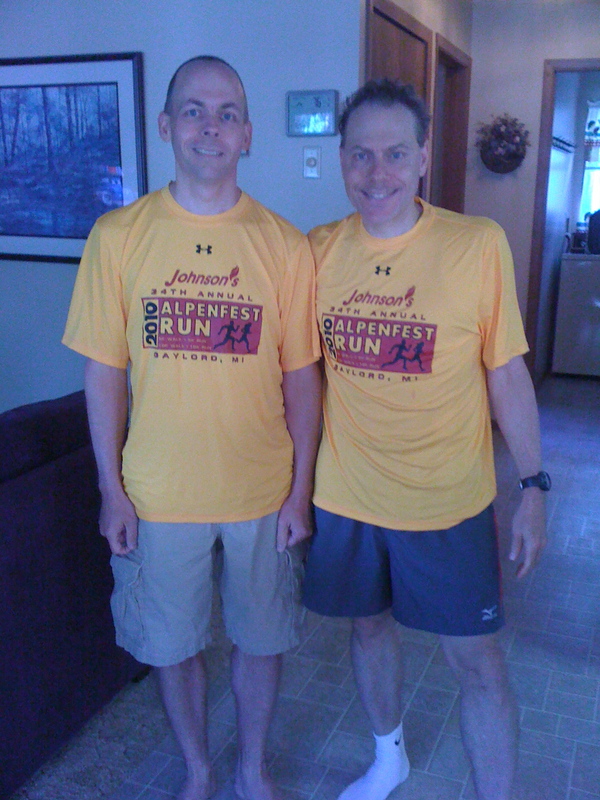 2) Alpenfest 10k - Gaylord, MI - This is a great smaller race up north near my cottage. It has a nice out and back route and a run through a park/nature preserve. They also gave underarmour tech shirts last year and I hope they do the same this year. The is the only race I have been to where they had strawberries at the finish line. Yum! I can't wait to do this race again. 3) Capital River Run Half Marathon - Lansing, MI - This is a race that I have not done before but it looks like a great route through our State's Capital along with part of Michigan State University and some nice pathways too. I wish it was closer to me but it should be worth the drive. There is a half marathon the same weekend right near my home but I have not heard that great of things from it and have heard good things about this race so we shall see. Question of the Day? Are you committed for races the rest of the year or do you like to just sign up last minute? For me - it's about saving money and staying committed. I'm doing the 10 miler too!! I have a tentative schedule and try to sign up as early as possible. Though, my commitments are pretty sparse through the summer and I'm playing it by ear and registering closer to the date to make sure I'll stick to it. Did you get some serious hail early this morning? I'm glad it cooled off, but that hail sounded like it was doing a beating on my house! Sometimes I sign up last minute, but my marathon I signed up for right away, basically so I could back out! Great races! I have committed to only 3 races this year and don't know if I will do anymore this year. Generally, I know my race calendar by Jan 1 of the year but I am trying something new this year, less racing. I don't know if I like that or not! I love being committed! It gives me something to train for and look forward to. From July onwards I'm committed to a race practically every weekend for the rest of the year. I'm committed to some races in 2014 already. I try to register way in advance for races so I keep myself accountable. I am doing an urban adventure race in July and haven't decided yet on the GR full or half marathon in October. One of my running friends says the Solstice Run is one of his favorite races. I have never done it ( I miss out on most Saturday races due to work) but I hear it is great! Meg & Tahoegirl - we should meet up for a picture before the race!!! Amy - I would not say my favorite but it is a challenge and besides Crim, this is the only 10 mile I know about in this area. SlimKatie - Yes, I ran the Brooksie last year. It's a great course but you need to train for hills because it's a challenging course. Lots of fun, very organized, nice shirt, good expo at Oakland University, great area to run. No hail for us, just windy! Steph - I hear you. That's how I feel. RR - don't back out, no!!! Johann - 2014! Wow, over 2.5 years ahead! Haha! Strawberries at a finish line sounds amazing! You are lucky to have a few options for 10Ks (even if you are signed up for only one). They are few and far between here.